When we think of fiberglass, most of us think of pole vaulting or sailboats or tub/showers, but it is one of the most popular choices for high-performance window frames. Although it tends to be durable since it expands and contracts similarly to the glass it holds (since glass is the main components of fiber glass), fiberglass does need to be protected from UV radiation for long-term durability. Thus, it may be covered on the outside with a thin coating. It is hard to beat fiberglass for thermal performance. Fiberglass conducts heat slowly like uPVC and wood, and because it is stronger than both of them, it can be shaped under high pressure to thin, but strong, shapes. Window frames all have a cross-section “profile,” and fiberglass profiles have less structural material than most. Thinner material conducts less heat. And it provides even more room within the frame for insulation. Many fiberglass window frames are filled with plastic foams which insulate even better than the multiple air spaces created by the channels in a uPVC frame. Fiberglass is so strong that it allows lower-profile frames than wood and even some uPVC. Fiberglass frames may be nearly as thin as aluminum, steel, and bronze frames. This increases the percentage of the window that is glass to allow greater passive solar heat gain. A higher fraction of glass may be a benefit in some climates, for example in regions with cold but sunny winters. 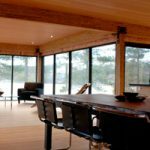 However, it may be a detriment in climates where long, sunny summer days bring unwelcome passive solar gain; however, low solar heat gain coatings applied to the glass as well as external shading can prevent overheating. In fact, fiberglass is so strong that it is now being combined with uPVC to provide additional stiffness and strength to uPVC frames. You will want to look at manufacturers’ websites closely in both this Fiberglass frame page and the uPVC frame page as some window frames include both materials. Inline Fiberglass is the world leader in the development, design and application of High Performance Energy Efficient Windows.